tl;dr: We have launched a WordPress plugin for editing and publishing your Ads.txt file right from your WordPress dashboard. 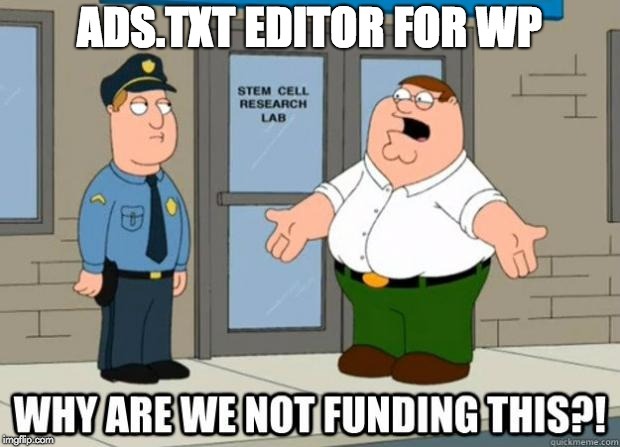 If you’re a publisher, head to WordPress.org ASAP and install it our ads.txt plugin or search for “Ads.txt Publisher” on WordPress.org. You’ll thank us later. More than 70% of the publishers said they don’t update their Ads.txt file as often as they would want to. More than 60% of the publishers think this causes them to generate less revenue than they could. More than 80% blamed technical difficulties as the reason for not updating the file as often. If you’re a publisher, you know what we’re talking about. Updating your Ads.txt file usually means asking the IT guys for help, gathering around all kind of lines from various demand partners, worrying about mistakes and duplications, or in other words – a big mess. So a couple of months ago we’ve looked at the poll results, and decided to step in and do something for our publishers, and publishers in general for that matter. We’ve decided to start with WordPress, the leading publishing platform, and develop a plugin. This way publishers can simply install our ads.txt plugin from their dashboard, and enjoy an editor like they expect and enjoy for writing and publishing posts to their website. But wait – there’s more. We have added a smart text processing feature that analyzes your Ads.txt lines, and notifies you if you have any errors or just duplicate lines. And last but not least – we’ve added an option for your IT guy, the one that installs the plugin for you, to invite you to the widget in a safe and elegant way, so that you can edit your Ads.txt file but not mess with anything else. We have been testing our plugin for a couple of weeks now with some of our publishers, and the feedbacks are great. So now we’ve decided to share it with the (publishers of the) world. All you need to do is install it from WordPress.com or search for it from your WordPress dashboard. You’ll thank us later. Oh, and we would love to hear your feedbacks, and hopefully share it here in a couple of weeks.